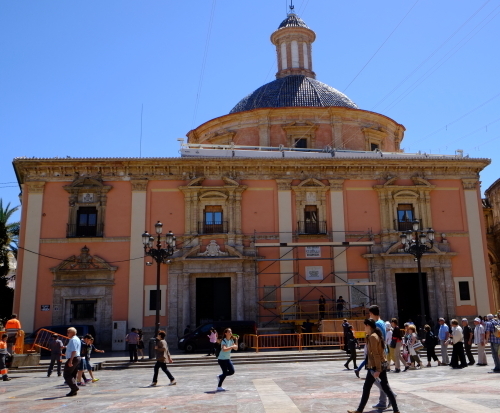 The ValenciaCathedral was called Iglesia Mayor in the early days of the Reconquista, thenIglesia de la Seo), and by virtue of the papal concession of 16 October 1866,it was called the Basilica Metropolitana. It is situated in the centre of theancient Roman city where some believe the temple of Diana stood. 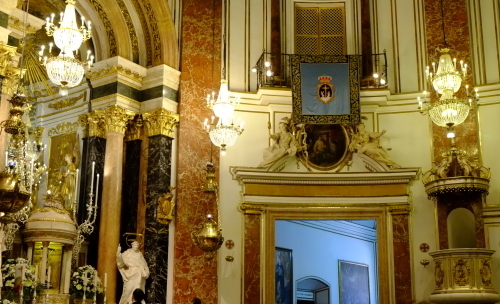 In Gothictimes, it seems to have been dedicated to the Holy Saviour; the Cid dedicatedit to the Blessed Virgin; King James I of Aragon did likewise, leaving in themain chapel the image of the Blessed Virgin, which he carried with him and isreputed to be the one now preserved in the sacristy. 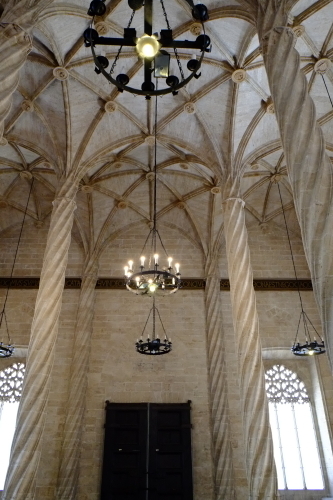 The Moorish mosque, whichhad been converted into a Christian church by the conqueror, was deemedunworthy of the title of the cathedral of Valencia, and in 1262 Bishop Andrés de Albalat laid the cornerstone of the new Gothic building, with three naves;these reach only to the choir of the present building. Bishop Vidal de Blanes builtthe chapter hall, and James I added the tower, called El Miguelete because itwas blessed on St. Michael's day in 1418. 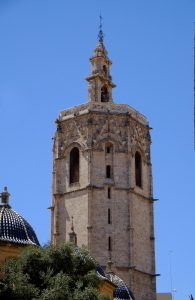 The tower is about 58 m high andtopped with a belfry. In the 15thcentury the dome was added and the naves extended back of the choir, unitingthe building to the tower and forming a main entrance. 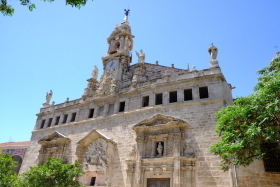 Archbishop Luis Alfonsode los Cameros began the building of the main chapel in 1674; the walls weredecorated with marbles and bronzes in the Baroque style of that period. At thebeginning of the 18th century the German Conrad Rudolphus built the façade ofthe main entrance. 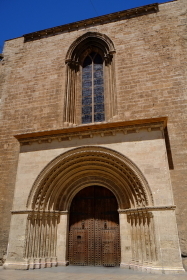 The other two doors lead into the transept; one, that of theApostles in pure pointed Gothic, dates from the 14th century, the other is thatof the Paláu. The additions made to the back of the cathedral detract from itsheight. The 18th-century restoration rounded the pointed arches, covered theGothic columns with Corinthian pillars, and redecorated the walls. 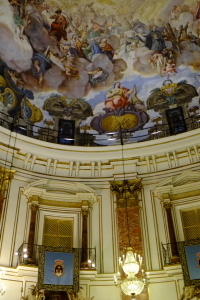 The dome hasno lantern, its plain ceiling being pierced by two large side windows. 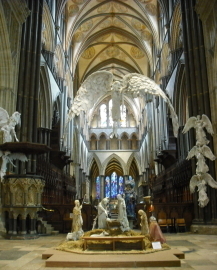 There arefour chapels on either side, besides that at the end and those that open intothe choir, the transept, and the sanctuary. It contains many paintings byeminent artists. A silver reredos, which was behind the altar, was carried awayin the war of 1808, and converted into coin to meet the expenses of thecampaign. 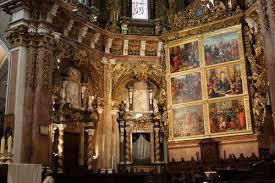 There are two paintings by Francisco Goya in the San Francescochapel. Behind the Chapel of the Blessed Sacrament is a small Renaissancechapel built by Calixtus III. Beside the cathedral is the chapel dedicated tothe Our Lady of the Forsaken. 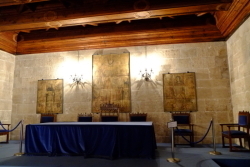 The Tribunal delas Aguas (Water Court), a court dating from Moorish times that hears andmediates in matters relating to irrigation water, sits at noon every Thursdayoutside the Puerta de Apostoles (Portal of the Apostles). 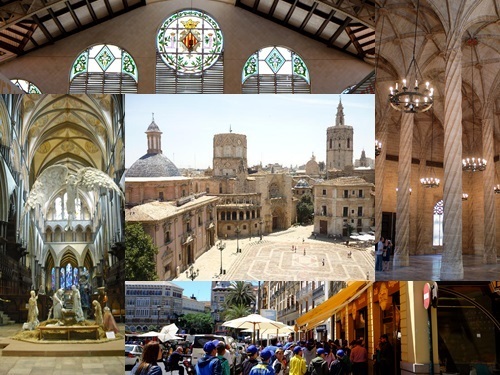 TheLlotja de la Seda is a late Valencian Gothic style civil building in Valencia,Spain, built between 1482 and 1548, and one of the principal touristattractions in the city. The UNESCO considered it as a World Heritage Site in1996 since "the site is of outstanding universal value as it is a whollyexceptional example of a secular building in late Gothic style, whichdramatically illustrates the power and wealth of one of the great Mediterraneanmercantile cities." Behindthe current building, there was an earlier one from the 14th century, which wascalled the Oil Exchange.Valencia's commercial prosperity reached its peakduring the 15th century, and led to the construction of a new building. thisinscription showed that it was not a necessary to be a Protestant or aforeigner to establish the basis of a good trade; it also showed the union ofethics and economy. World-renowned architect Santiago Calatrava produced thefuturistic City of Arts and Sciences, which contains an opera house/performingarts centre, a science museum, an IMAX cinema/planetarium, an oceanographicpark and other structures such as a long covered walkway and restaurants. Calatrava is also responsible for the bridge named after him in the centre ofthe city. 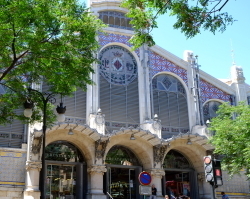 The Music Palace is anothernoteworthy example of modern architecture in Valencia.UNESCOhas recognised the Silk Exchange market, erected in early Valencian Gothicstyle, as a World Heritage Site.] 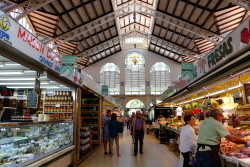 The modernist Central Market is one of thelargest in Europe. The main railway station Estación Del Norte is built in modernisme)style. The ancientwinding streets of the Barrio del Carmen contain buildings dating to Roman andArabic times. 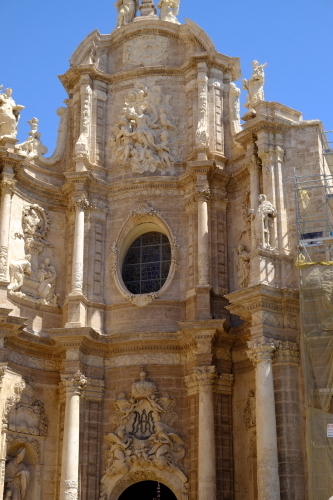 The Cathedral, built between the 13th and 15th centuries, isprimarily of Gothic style but contains elements of Baroque and Romanesquearchitecture. 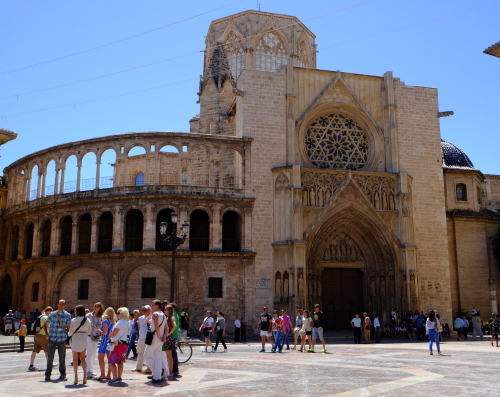 Beside the Cathedral is the Gothic Basilica of the Virgin. 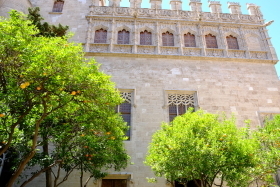 The15th-century Serrano and Quart towers are part of what was once the wallsurrounding the city.